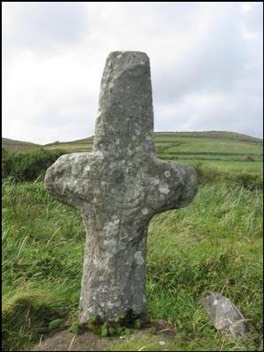 Research and Photos related to one of Irelands great treasures, the Irish High Crosses. 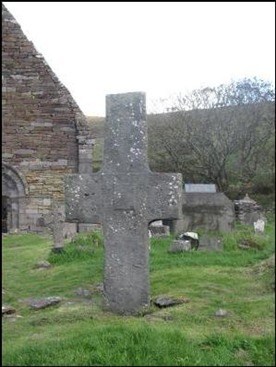 This article discusses the High Crosses of County Kerry, and where possible the history of the site and the identity of the founding saint. These crosses are located at Killiney, Kilmalkedar, Magharees Islands, Reenconnel, and Tonaknock. These crosses are the ones listed by Peter Harbison in his 1992 publication on the High Crosses of Ireland. 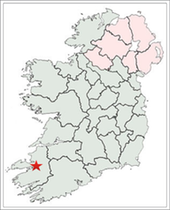 The location of County Kerry is indicated by a red star on the map to the right. In the case of County Kerry there is also basic information, and where possible a photograph of additional crosses listed by Henry Crawford in his 1907 article “A Descriptive List of the Early Irish Crosses. Crawford did not define the term “early”. He simply noted that he includes only “actual crosses — not cross slabs”. 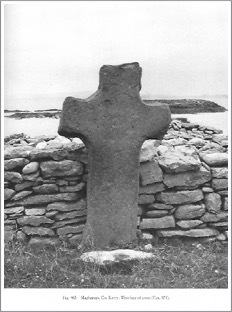 (Crawford, p. 187) These crosses are: Kilbeg/Ballincolla, Blasket Islands/Inishtooskert, Dunquin/Ferriter’s Quarter, Fahan/Kilvickadownig, Templebeg, Skellig Michael (7 foot), Skellig Michael (5 feet). 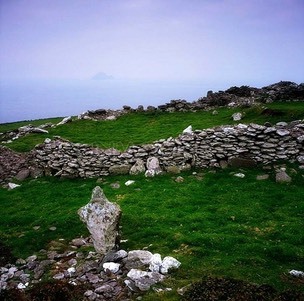 Crawford also notes the presence on Skellig Michael of numerous small, crude crosses, many of them around the monks graveyard. 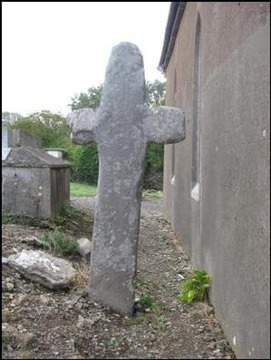 This cross [left] stands behind the church at Killiney and very close to the south wall of the building. Saint Enna founded a monastery here in the 7th century. (http://www.earlychristianireland.org/kerry/kerry_killiney.shtml) Assuming a 7th century date for the founding, this was not the Enna associated with the Arran Islands. He reportedly died in the early 6th century. Getting There: See the Road Atlas page 56, first column, second row. Located between Castlegregory and Stradbally north of the N86 on a minor road. The cross is located behind a church building. The map is cropped from the Historic Environment Viewer. This sandstone cross, pictured below, is 2.5 metres tall. The only decoration is a raised square in the center of the crossing and a smaller square at the center. 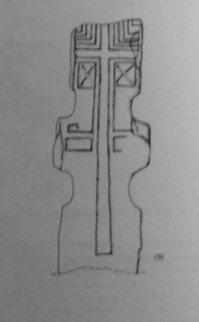 (Harbison 1992, p 130) It is unusual, though similar to the Reenconnell cross described below, in that the arms extend from the shaft about midway from the base to the top of the cross. It is said the monastery at Kilmalkedar was founded by Saint Maolcethair, son of the King of Ulster, who died there in 636. He chose the site because it is near Mount Brandon, a pre-Christian religious symbol. The pilgrim’s track leading to Mount Brandon passes through Kilmalkedar. 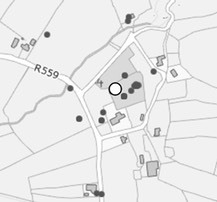 Also present on the site are the collapsed St. Brendan’s oratory, a 12th century church, a stone with Latin letters known as the Alphabet Stone, an Ogham stone and a Sundial. Getting There: See the Road Atlas page 55 third column, third row. Located on the Dingle Peninsula near Murreagh and along the R559. The map is cropped from the Historic Environment Viewer. An early ecclesiastical site is located on Illuantannig, the largest of the Magharees Islands. The monastery was reputedly founded by St. Senach. According to Catholic Online Senach was born in 488 near Kilrush in County Clare. It has been suggested that his name in the old Gaelic means “ little old wise man. He is presumed to have died on Scattery Island in 544. The monastery there was one of several he founded during his career. 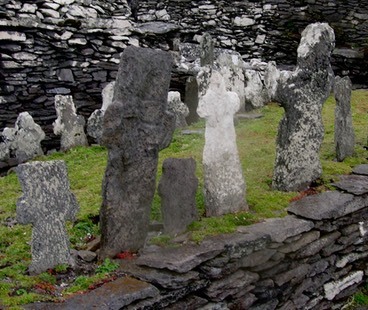 (catholic.org/St.Senan) There are two oratories, three beehive huts, and three stone slabs in addition to the cross within the monastic enclosure. Getting There: See the Road Atlas page 56, 1 1. 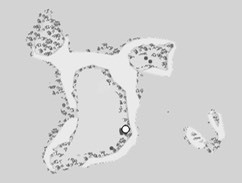 Located on an island north of Rough Point. Transportation may be available from Fahanmore harbor, located north of Castlegregory on the west side of the peninsula. 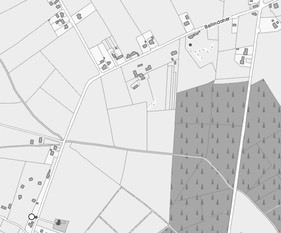 Reenconnell is near Kilmalkedar, Reask and the oratory of Gallarus. This cross is said to be in the location of an ancient cemetery. Little else is known of the history of the site and the cross is all that survives. Finding Reenconnell was interesting. Peter Harbison describes it as standing in the second field in from the road. The National Monument Service provides a map that got us very close. Neighbors in the area gave us the final clues. It was not, however, until I walked across the first field and entered the second that I could see the top of the cross in the distance. It is certainly not visible from the road. Getting There: See the Road Atlas page 55, third column, third row. Located on the Dingle Peninsula east of Murreagh. From Dingle Town take the R549 north. About five km along the road you will come to an unnamed road going west. Go west (left). The road you are looking for is just below the “dar” of Kilmalkedar on the Road Atlas. There is a short lane just before the first house along the road. The fields can be accessed from there, the second field in from the road to the north. The map is cropped from the Historic Environment Viewer. The only decoration on this cross (see photo to the right) seems to be small incised circles on the west head and face. It is believed to date from the 9th century. Legend says the south arm was broken by a cannon ball during the Desmond insurrection in the 16th century. The cross probably dates to the 7th-century suggesting that there was a monastery there that was either taken over or renewed by the Canon Regulars. Getting There: See the Road Atlas page 57, third column, first row. Located north of Tralee and west of the R556. Pass through Abbeydorney. About three km beyond Abbeydorney take a road that angles back to the left. The cross is standing beside the road on your right less than one km from the turn. The ruin of a church is across the road from it. On the map to the left the road that runs north/south is the R556. Other Kerry Crosses: For these crosses the descriptions and locations are taken, with one exception, directly from Crawford’s article noted above. "A rough Latin cross, 1 foot 9 inches high, with a plain cross incised on the south side. In an old graveyard called Kilbeg, near Ferriter’s Cove, 7 miles west of Dingle.” (Crawford, p. 206) Ferriters Cove is located north of the B559 just northeast of Clogher. There is an Early Christian site just north of Baile an Chala in a field. This may be the location. The image to the right can be found on numerous websites. 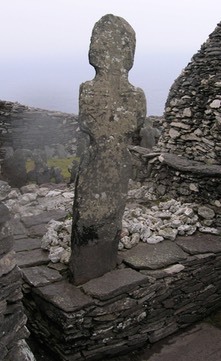 This image was copied from imagine.com, Inishtooskert, Blasket Islands, Dingle Peninsula, County Kerry, Ireland. The cross in the foreground is the only one of the two or three for which photos could be found. "A rough Latin cross, about 2 feet 6 inches high, cut out of a flagstone. On a heap of stones in a field west of road near shore, 1 mile south of Clogher Head.” (Crawford, p. 206) A cross is marked on the Survey Map at this point, just west of the B559. "A rough Latin cross, 2 feet high, on a heap of stones. The south side is sunk, leaving a raised rib following the outline. 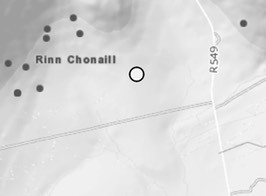 In field called Parknacrusha, north of road, 5 and one half miles west of Dingle.” (Crawford, p. 206) There is not a cross listed on the Survey Map for this area. The townland of Kilvickadownig is located in a bend of the R599 northeast of Dunbeg Promontory Fort. The field may or may not be know locally by the name Partnacrusha. "The upper part of a small rude cross, rough and plain. In the east window of the ruined church called Templebeg.” (Crawford, p. 206) The ruins of Templebeg church may be in the area of the Beehive Huts near Fahan Village just to the west of Dunbeg Fort. 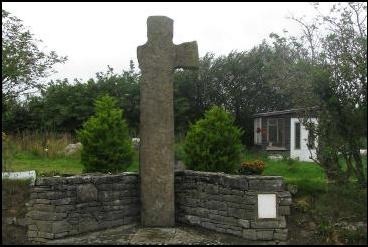 There is mention related to this church of an inscribed cross and of the Fahan cross described above, but not of a cross at Templebeg. "A rude cross, about 5 feet high, similar to the 7 foot cross above. Near summit of island.” (Crawford, p. 207) The cross pictured to the right below seems to be this cross. 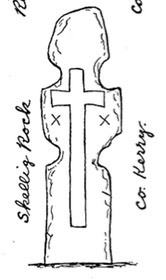 O’Sullivan and Sheehan describe this cross as follows: “This large stone cross, with hollowed angles and slightly projecting arms, stands on leacht (13). Almost the entire length of its W face is occupied by an outline Latin cross, the open-ended arms of which extend to the sides of the stone. A series of diminishing L-shaped grooves occupy the spaces between the arms of the cross and the upper sides and top of the slab, while beneath each arm is a diagonal cross framed by a grooved rectangle. Extending down from the inner end of each rectangle is a long linear groove; that at N turns outwards sharply to form an angular volute. Beneath both examples, on the arms of the slab, are traces of grooved rectangles. H: 1.47,, W: .57, T: .06m.” (O’Sullivan, p. 288) In addition, they provide an illustration, seen to the left. A careful examination of the cross to the right seems to match the description of the cross illustrated to the left. The dimensions seem correct as do the design features. It is was obviously not standing in 2008 as was the cross described by O’Sullivan and Sheehan in 1996. It also appears to have suffered additional damage. 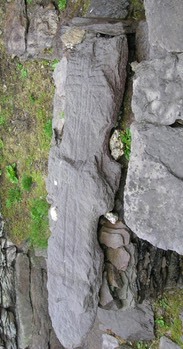 As noted above, there are numerous additional stone crosses on Skellig Michael. Detailed information on these can be found in The Iveragh Peninsula: An Archaeological Survey of South Kerry by Ann O’Sullivan and John Sheehan. The photo below left shows a number of crosses and cross slabs around the Monks Graveyard. Harbison, Peter; "The High Crosses of Ireland: An Iconographical and Photographic Survey", Dr. Rudolf Habelt GMBH, Bonn, 1992. Volume 1: Text, Volume 2: Photographic Survey; Volume 3: Illustrations of Comparative Iconography. Meehan, Cary, "The Traveller’s Guide to Sacred Ireland", Gothic Image Publications, Gastonbury, Somerset, England, 2002. O’Sullivan, Ann and Sheehan, John, The Iveragh Peninsula: An Archaeological Survey of South Kerry, Cork University Press, 1996.